Notice how a tree sways in the wind. Run your hands over its bark. Take in its citrusy scent. As a society we suffer from nature deficit disorder, but studies have shown that spending mindful, intentional time around trees - what the Japanese call shinrin-yoku, or forest bathing - can promote health and happiness. 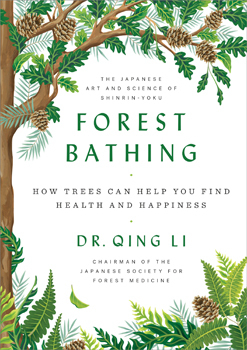 In this beautiful book - featuring more than 100 color photographs from forests around the world, including the forest therapy trails that criss-cross Japan - Dr. Qing Li, the world's foremost expert in forest medicine, shows how forest bathing can reduce your stress levels and blood pressure, strengthen your immune and cardiovascular systems, boost your energy, mood, creativity, and concentration, and even help you lose weight and live longer.